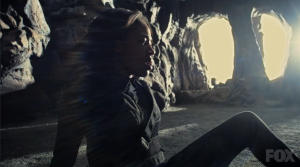 Before we get into the review for the Sleepy Hollow return from mid season hiatus show, let’s discuss the problems a show like Sleepy Hollow has with a cliffhanger and a mid season hiatus. As you can tell, I am writing this almost a month after Sleepy Hollow returned to the air. Why so long? Because I lost interest. Why did I loose interest? Because a mid season hiatus. I really don’t recall much of what was going on at the end of the first half of the season. I know the basics. The Witnesses have been fighting Pandora who has been pulling weekly monsters from her box. She resurrects some big bad Egyptian who needs power that Jenny accidently ingested, and as he is trying to get the power out, Abbie distracts him, takes the power, and escapes into demon world before the power catastrophically explodes. So I get the basic plot, but after a couple of months, I just don’t care anymore. I have no emotional attachment to this storyline. I don’t care about Jenny and Joe’s relationship; I don’t care about Abbie’s new boss. Too much time has passed. So the 2nd part of the third season starts, and I don’t care. I miss the first episode, then I can’t watch the 2nd episode because this horrible concept of having an over reaching season arc means I will be lost if I miss an episode. To be honest, the only reason I went back and started watching the 2nd half of season 3 is because of this blog. I didn’t like the idea of having only half of season 3 reviewed. 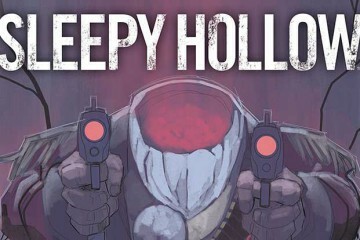 It is a pity too, because I really like Sleepy Hollow. I think the concept is fantastic, the actors do an incredible job, the look of the episodes is great. The only thing that lets me down time and again is the writing. The episode opens with Crane back in revolutionary times. He gives Nathan Hale some tips on caution and subtlety. Tips that neither he, nor Hale take. We cut to modern times when Crane bursts through a wall on a motorcycle with a stolen artifact (so much for subtlety). He barely escapes his pursuers, and heads back to his base of operations. We don’t know how long it has been since the events of the last episode. We can guess that it isn’t the next day, but it hasn’t been as long as we have been waiting either. Jenny and Joe go looking for a map that tracks demons. Pandora and her Egyptian guy friend are hiding out in an old mill. There, Pandora uses a piece of her box to summon some witch that she thinks can help her. Meanwhile, Crane heads off to the place where Abbie disappeared with his stolen artifact and try’s to do some magic. It doesn’t seem to work, but he does see that he has been followed by agent Foster. Crane leaves his artifact, and heads out with agent Foster, and something happens with the artifact and tree. 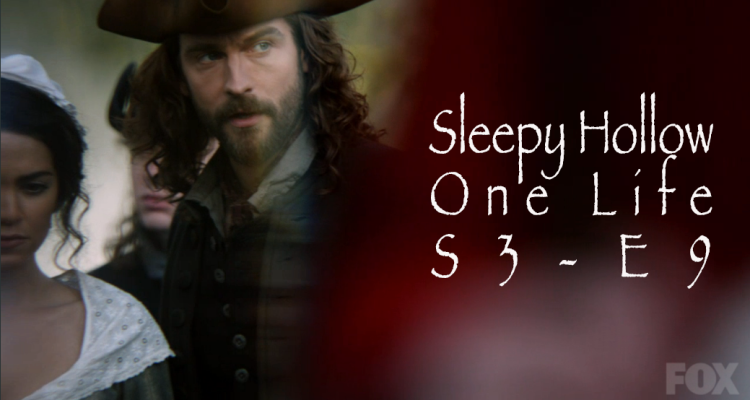 This is where this episode of Sleepy Hollow really shows off what it is we love about this show. Crane is home alone trying to cook a microwave lasagna in a skillet in a scene of subtle humor that is truly great television. He suddenly hears a noise and shots off the stove to go and investigate. In a sequence that would fit right in with any top horror film, Crane investigates the noise only to see a fogged up mirror in one of the bedrooms mysteriously get the words “Help Me Crane” written into them. As he goes to investigate, a mirrored hand reaches out of the mirror and grabs his arm trying to pull him back into the mirror. The hand releases him, but leaves him with a strange symbol on his arm in the form of a welt. This is truly a masterly crafted horror scene, yet it doesn’t end there. After the force has left, crane is meticulously examining the mirror. He gets a phone call from agent Foster who is accusing him of breaking into her apartment. Why? Because someone scratched “Help Me Crane” into her floor. Crane rushes over. 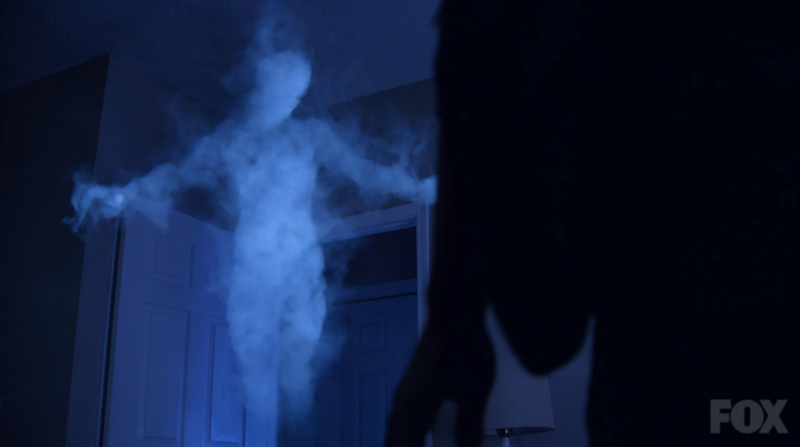 As agent Foster shows Crane the message, a cloud of smoke forms a person in the corner of the room. As it rushes past them, it leaves a mirror image of the mark that was on Cranes arm on agent Fosters arm. Crane and Foster return to the library where they determine that the symbols are a mirror image of each other and they represent a gate. A gate made with a mirror. The try to make the gate, and Crane goes into the mirror while Foster stays outside holding a rope tied to Crane (ala Poltergeist). When Foster pulls Crane out, he has a demon witch with him who looks like something right out of a Japanese horror film. The demon fights with Crane for a moment, but eventually it escapes their grasp. Crane researches the demon and finds that it feeds on desperation. 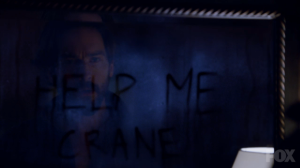 It went after Crane because of his desperation to find Abbie. Foster gets a call to a murder scene that looks like the killer was the same demon, so she brings Crane along with her. They figure out that the demon is specifically going after people who are desperate to find Abbie, and it’s next target is Daniel Reynolds. They get there first, and are able to stop the demon and put it back into the mirror. Jenny and Joe manage to get the map they were looking for after a few adventures dropped throughout the episode. They show it to Crane and Foster. The map shows that demons from all over the world seem to be converging on Sleepy Hollow. And the second half of season 3 begins. 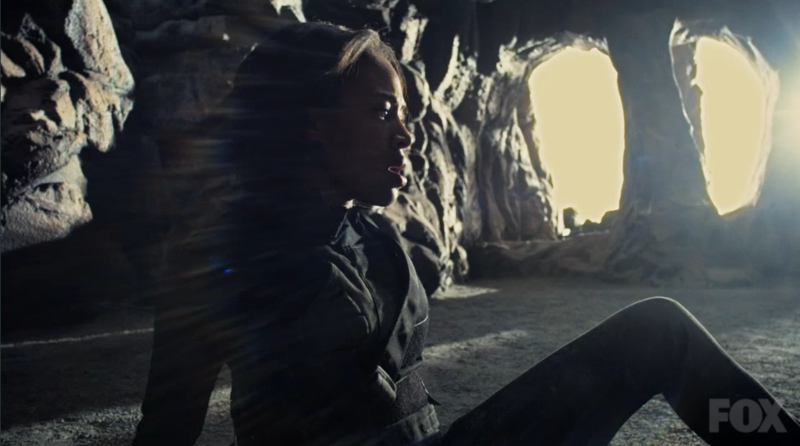 The episode ends up with a shot of Abbie in her alternated dimension, because I guess she is contractually obligated to be in all the episodes. Oh yeah, also during this episode we see Nathan Hale get captured by the British, Icabod wants to help him, but is told it is to risky. We get to see Hale hang for spying on England, and he gives his famous last words “My only regret is that I have but one life to lose for my country”.